Because I'm evil and also because I randomly decided I want to make every other ship I publish fairly powerful while making every other ship underpowered. This is my 4th ship, so underpowered it is. I wanted to make the weakest ship you might possibly imagine but still have a chance at surviving with - 4 crew teleporter might be quite strong but come on, I don't want it to be completely unfair. I made 3 variations of this ship, one per A/B/C slot of the rock ship. While they're all quite similar, I couldn't decide quite how horribly evil I wanted to be (and because I was undecided between Hermes and beam drone, and when I asked Anistuffs he suggested missile drone)... so now you can suffer extra much by playing each layout until you ragequit! And then come back and tell me which one is the most prone to RNG or the least difficult, and I might change it. Also tell me if you manage to pull off a victory somehow... be it with sheer epix awesomeness, or a free BL2. 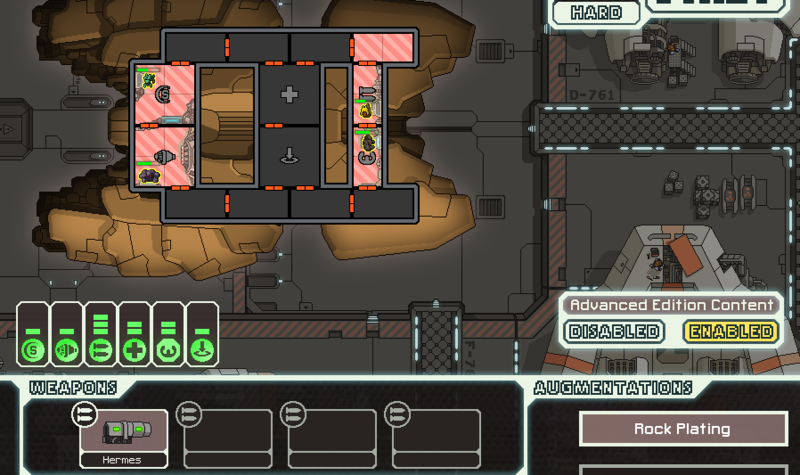 Image is of variant A, variants B and C have drone control instead of weapon control, and missile drone on B and beam drone on C. Because variant C is extremely horrible otherwise, I made it start with O2 (instead only level 1 medbay). Variant B also has an engi instead of the slug, because why not? I'm really undecided on the crew front as well. 8 starting power for layout A, 7 for layouts B and C. So yeah, you get 1 power for that level 1 shield. Each variation has the same number of weapon and drone slots. Airlocks are overrated. As is separating key systems. Renaming a ship ingame doesn't allow you to enter apostrophes but they still work fine if added in the xml files, so if you rename it and erase the apostrophe you can't get it back. Not like you'd have much time to rename it anyway since your crew would die before even starting. You'll be sitting around waiting for crew to heal a lot. Maybe I should replace Rock Plating with Engi Med-Bot Dispersal? Off topic, but I already have my next two ships' quirks mostly planned out. Don't worry, neither of them should hopefully be quite as rage-inducing.